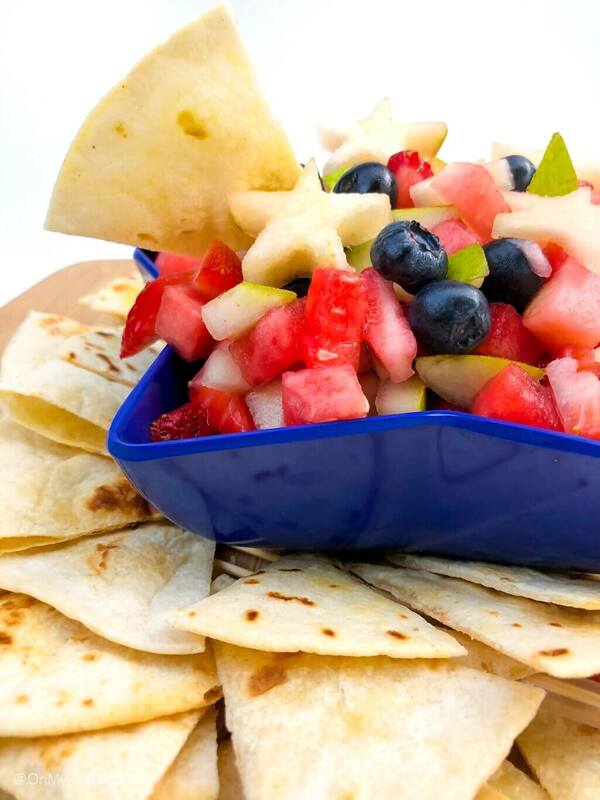 This summer red white and blue fruit salsa recipe is what winter dreams are made of. This salsa is a mix of some of the freshest flavors of summer and is a great addition to any Fourth of July, memorial day or labor day party. I’ve made this one feel a bit more fun with some red white and blue colors, and a few pear stars to garnish the top. This whole dish is quick easy and refreshing, and a great way to change things up for a crowd. *This post does contain affiliate links to products we love, and we may earn a small commission if you purchase from these links. 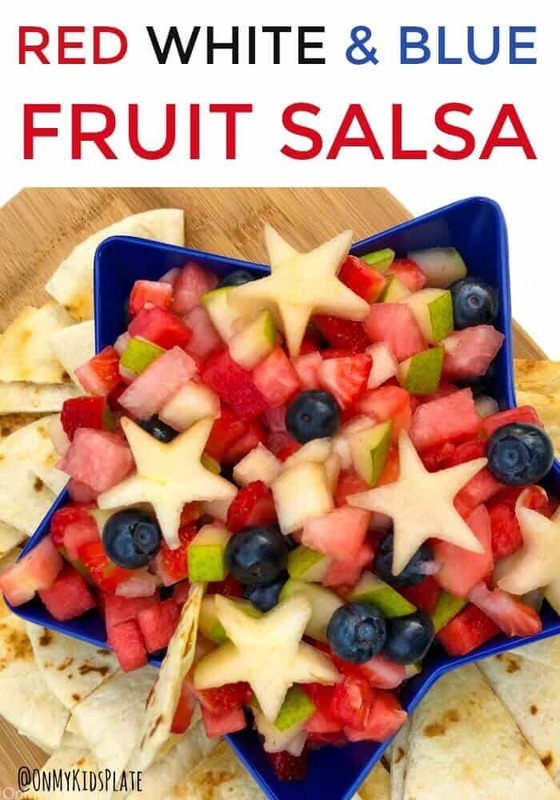 If I’m being totally honest, I started out enjoying this Red, White and Blue fruit salsa with my family. We were BBQing that night and it was just the perfect summer evening hanging out by the grill eating siders, corn on the cob and fruit salsa. We still had a little of this fruit salsa and after a few days? I found myself skipping the chips and scooping it straight out of the container with a spoon! Watermelon is what keeps this fruit salsa on its toes. It gives the whole fruit salad a crisp and refreshing taste that just screams sunshine in a bowl. 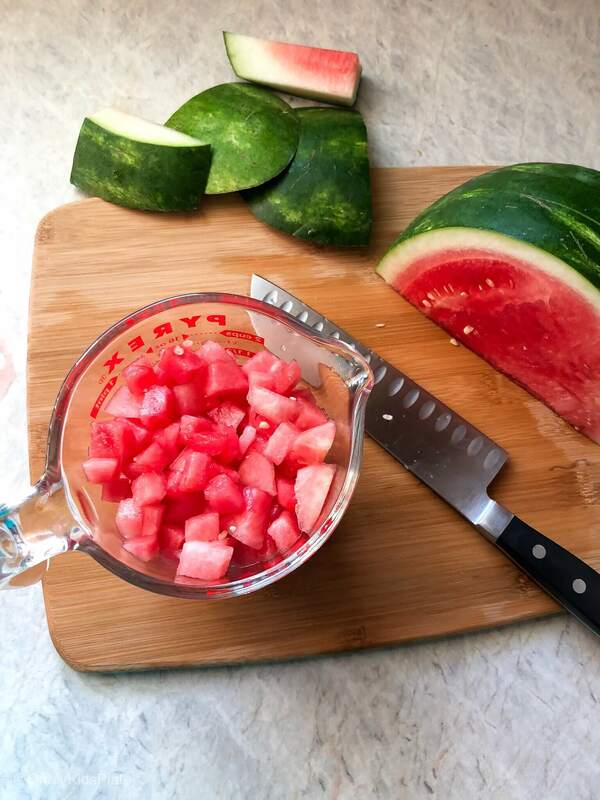 Watermelon can sometimes during the season get a little squishy, so I’d recommend using a fresh watermelon for this recipe, and not using the watermelon that’s been already cut and condensating in your fridge for a few days. Don’t let that stop you from making this fruit salsa ahead of time. I’ve prepared this salsa the day before a party and it is delicious the next day. I opted to make semi-homemade chips out of tortilla wraps. They whip up quickly, and it allows you to control just how much salty goodness is a part of your snack. You could also dust them with a little cinnamon sugar for a sweet option. But there are many storebought chips that pair well too. Some of my favorites are the multigrain chips from Food Should Taste Good for a salty chip. We also like the Snack Factory pretzel crips as a dipper. If you prefer to keep things a little sweeter and serve it like a dessert salsa, Stacy’s makes a yummy cinnamon chip. I think one of the things that makes this fruit salsa especially appealing to kids is the dipping factor. Many kids love a good dip, and this one is so fresh and light you can hand your kid a bowl full and let them go to town. This does also pack well for lunchboxes either in a bento box or in two separate containers so those chips stay crunchy. **To make the stars, it is easier to use a small star shape cutter. I used the star from this small fondant cutting set. I also adore this rainbow star cookie cutter set in various sizes. I’ve also had a few people ask about the blue star shaped bowl I used. I originally picked this bowl up as a lucky find in the Target dollar spot. Those items always seem to be that once they are gone, they are gone. 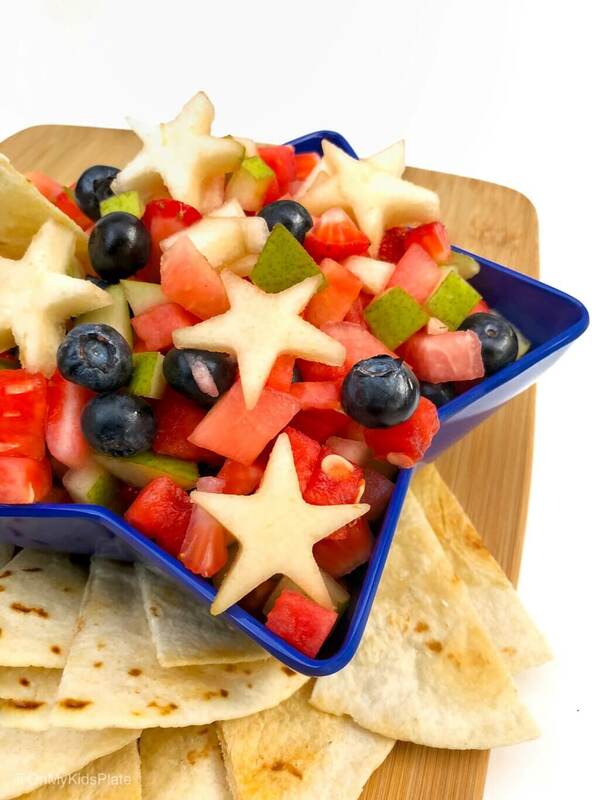 So here are few other cute star bowls that you could use to give your fruit salsa a patriotic feeling. This Red, White and Blue Salsa is full of summer flavors and is a great appetizer to serve at a party or a BBQ. Refreshing watermelon, flavorful strawberries, plump blueberries and crisp pears are all topped with a lime and honey dressing that everyone want to snack on. 6-8 tortillas I used taco sized, but you can use whatever size you have. Just adjust how big you cut the chips so they arre each about wo to three bites. Dice up 2 cups of watermelon and 1 cup of strawberries. Carefully slice pear into thin sheets. 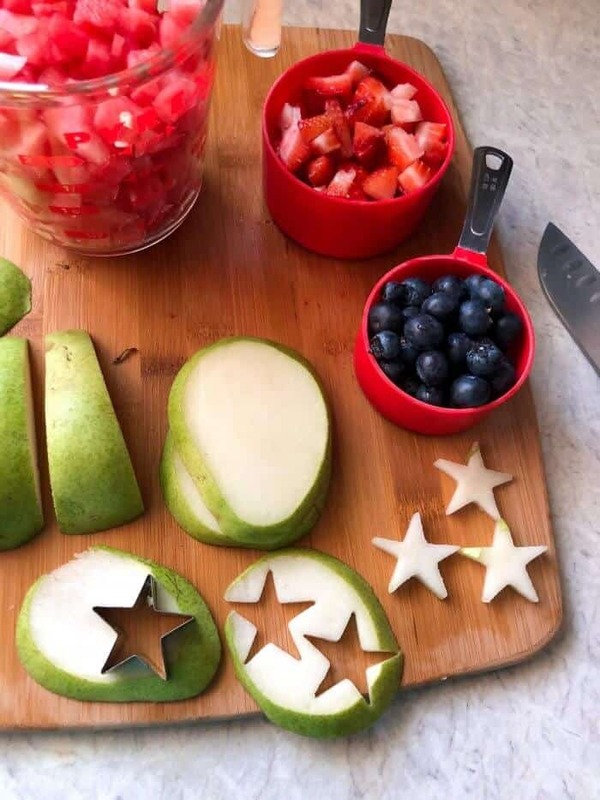 Cut a few star shapes for the garnish with a small cookie cutter, then dice the rest of the pear. 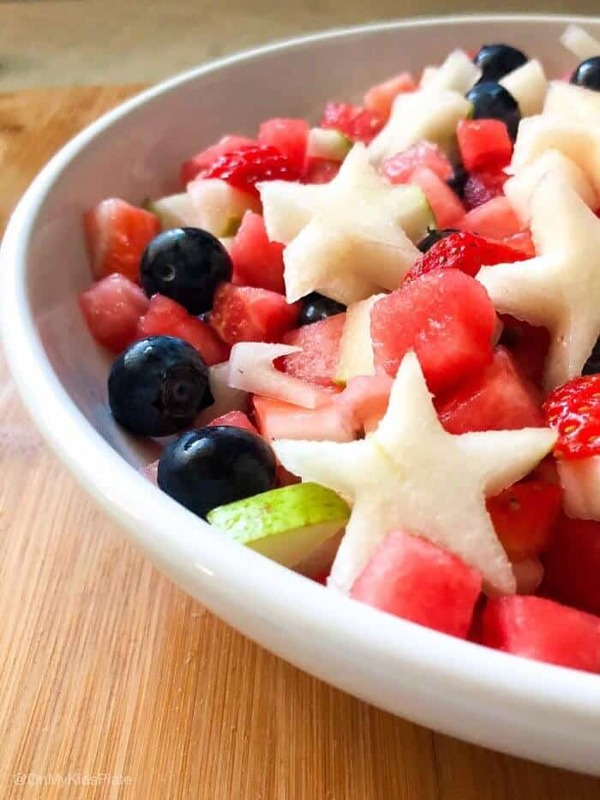 Mix together all fruit including watermelon, strawberries, pear (except stars) and blueberries. Mix together honey and lime in a small bowl. Pour over salsa and mix well. Cover a cookie sheet with aluminum foil, and spray with pan spray. Slice tortillas into triangle shapes, and spread onto cookie sheet. Spray tortillas with pan spray lightly on top. Cook for 3-5 minutes, then flip. Cook for an additional 3-4 minutes or until crispy. Add a sprinkle of salt, roughly a teaspoon. You will also need a mini star cookie cutter if adding the star garnishes. I had a full-size seedless watermelon, and roughly a quarter equaled two cups of diced melon. If you have a smaller melon, likely you will need a half of a melon.